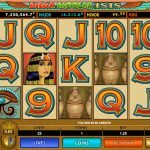 Mega Moolah Isis is another great addition to an already existing iconic jackpot slot Mega Moolah from Microgaming. This time we have an Egyptian themed slot with the Ancient Egyptian Goddess in the main role. She is known to be very generous with its worshipers so the best you can do to live a life of riches start doing the same. This is also a video slot game with progressive jackpot to offer. When it comes to special symbols and features we have plenty in Mega Moolah Isis. The wild symbol is the Goddess Isis herself and she substitutes for every other symbol except the scatter to complete a winning line. 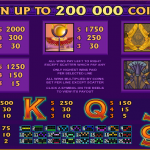 The scatter symbol is the Egyptian golden eagle and you need to land 3, 4 or 5 to win 20, 25 or 30 free spins respectively. The game is really generous when it comes to this feature not only with the high number of free spins you receive but also with the multiplier which is x 6. The progressive jackpot just like in Mega Moolah is activated randomly. You need to play the Wheel of Fortune game if you are lucky, and you can win one of four jackpots, Mini, Minor, Major and Mega Progressive. 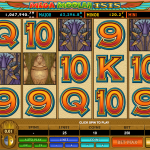 Mega Moolah Isis is another great addition to the Microgaming’s portfolio. This is one high quality slot that covers everything we are looking for in a game and the progressive jackpot is just another plus. Hitting the jackpot can be one very farfetched task but the adrenaline rush you get from playing this game is exquisite. This is where the game offers a consolation prize, the free spins feature which can be quite lucrative and it is also easy to activate. If you liked this one then you should definitely try its prequel, Mega Moolah a 5 reel slot by MicroGaming.